Engineers Canada is searching for nominees for its annual awards, celebrating the projects and achievements of engineers and engineering students. Nominations are open until January 19. This column marks the first of a series I will write during my term as CSC President. It has been an incredible journey to date. I have had the pleasure of serving our association with many great leaders, and learning from each of them. North America’s tallest wood condominium tower is being constructed in Québec City and will be completed by the end of 2016. 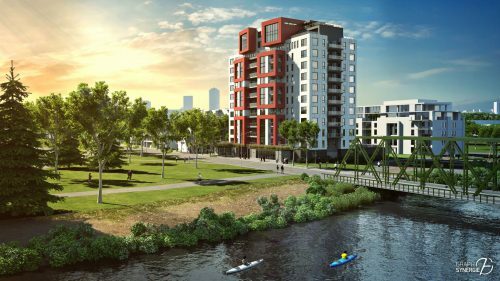 Origine, a green condominium project in Québec City’s Pointe-aux-Liévres Ecodistrict, is currently under construction and expected to be completed by the end of the year. Designed by Yvan Blouin Architects, the 41-m (135-ft) building will be 12 storeys high and include 92 units. It will be made of cross-laminated timber (CLT) above a concrete ground floor and feature natural-gas air- and water-heating, radiant flooring, and a ‘smart’ garbage chute. Origine is made possible through partnerships between the Government of Canada, the Québec government, Ville de Québec, and many research partners, such as FPInnovations. It was selected by Natural Resources Canada (NRCan) and received $1.175 million in funding under the Tall Wood Building Demonstration Initiative. The Québec Ministère des Fôrets, de la Faune et des Parcs sponsored unprecedented fire-resistance testing to demonstrate the structural stability in the event of a fire.